I think that pagans who want to get more in touch with their local environment would do well to learn more about local sacred plants, especially native plants, which I think are often overlooked, though cultivating an herb garden is also a good idea. I used to lead a native plant workshop at a local pagan festival, until the festival became prohibitively expensive for me to keep attending with my current financial situation. We went for a short hike around the festival grounds while I pointed out the plants and talked about each one. The workshop was well-attended, but I was somewhat disappointed at how often I got the question, “What kind of spell would this plant be useful for?” as the person snatched up a forb growing in the meadow. Giving people lists of “correspondences” for native plants was not exactly what I intended that workshop to be about. If you just want an herb for your money spell, you would probably do better grabbing a jar of dried basil next time you’re at the grocery store. What I was really intending for the workshop was to get people to learn more about the native plants of Central Texas. I want them to learn about the plants themselves. What kind of environments they grow in, when they bloom, what sort of mundane things did the Indians or pioneers use them for, as well as any magical properties they might have. I guess I’m too much of an animist to feel right about just pulling off some leaves to use for some spell, without getting to know the plant’s spirit first. So here’s my first post highlighting a local sacred plant that all people living in the Hill Country should be familiar with, and all pagans living in the Hill Country should revere: Sophora secundiflora. They are in full bloom sometime between Imbolg and Ostara, which is right now. 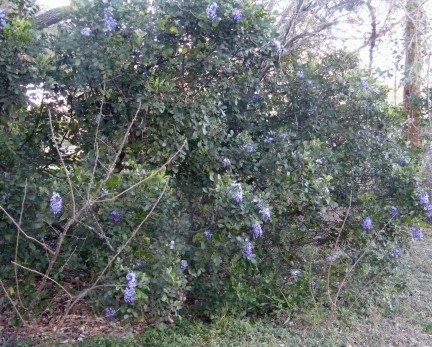 The common names for this plant include Texas Mountain Laurel and Mescal Bean. It is a small evergreen tree in the legume family. There are other small flowering trees in North America also called “mountain laurel” that are unrelated, hence the “Texas” part of the name. It lives in the Hill Country, all the way west to a small area in New Mexico, and south to Central Mexico. I tend to call the trees themselves “mountain laurels” and their seeds “mescal beans”. They’re one of my favorite trees, and I was delighted that most of the trees on our property we moved to a year ago are either live oaks or mountain laurels. They bloom in March with these fantastic purple inflorescences, which give off a strong, sweet, mouthwatering fragrance most people liken to grape soda or Kool-Aid. They’re fairly popular as a native ornamental plant. The parking lot where I work has a lot of them in the medians, though many people choose not to plant them, complaining that they grow much more slowly and don’t bloom for as long as that popular Chinese native, Crepe Myrtles. The thing is, most native plants here grow slowly. It’s how they survive the lack of water. 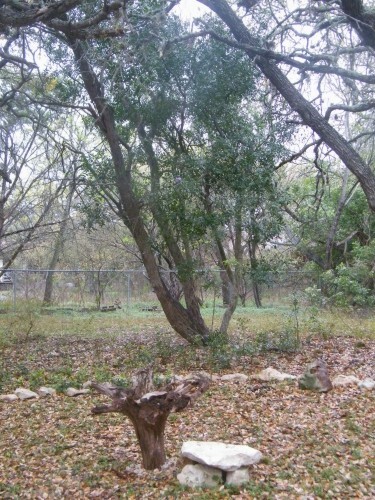 Mountain laurels grow in poor, rocky soil and can take just about anything Texas throws at them. And personally, the short bloom time (the blooms only last two or three weeks) seems to make them more special to me. I guess in a culture where we can get ripe strawberries in winter, people just don’t appreciate these brief, seasonal events that you have to enjoy right then until they’re gone for another year. 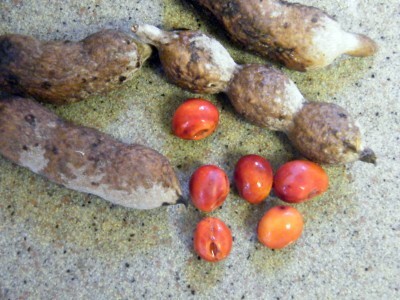 The purple flowers soon give way to peanut-like pods with bright orange-red seeds that litter the sidewalks and parking lots next to the trees. Maybe that’s another reason why some people are reluctant to plant them, because the seeds are listed everywhere as deadly poisonous. What I’ve heard is that plenty of kids have swallowed the seeds with no ill-effects, because they have very hard seed coats, so they pass through the digestive system unscathed. The toxin is inside the seed, and is only released if the seed is crushed or chewed up. Of course, caution is still warranted, but I’m certainly not going to chop down all my mountain laurels when I have a kid. OK, so now we come to the part all the pagans are waiting for. 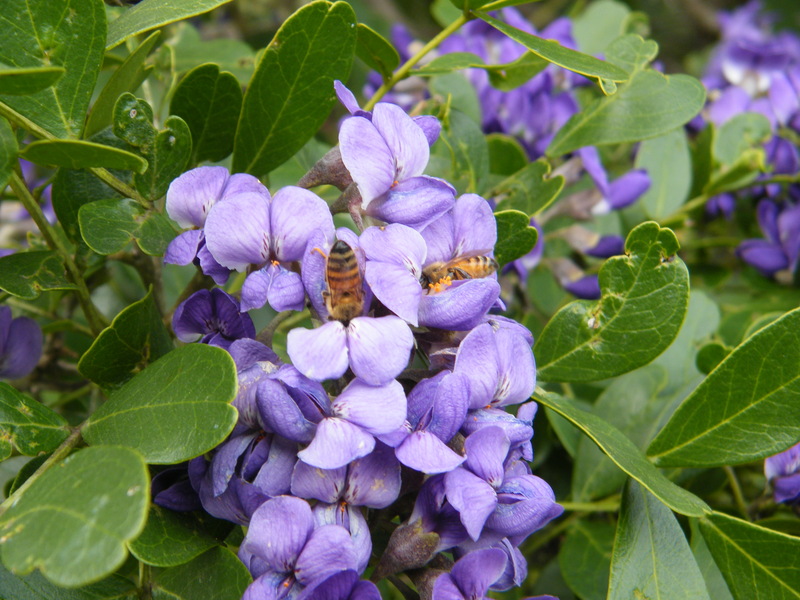 What are the magical properties of the Texas Mountain Laurel? Well, to figure that out, you should think about why their other common name is Mescal Bean, those “poisonous” seeds. You see, they’re also hallucinogenic, and were used as an entheogen by the Native Americans living in this area. The Indians would crush them up and ingest them in rituals, though the dosage is a bit tricky, and they can make you very sick or even kill you if you take too much. Once peyote cactus was imported from further south, using mescal beans as an entheogen was abandoned, since peyote gives a better high with fewer side effects. However, the mescal beans were still considered sacred, and even today Indians wear necklaces made of beads of mescal beans with holes drilled through the middle during their peyote rituals. I must say, they make a very pretty necklace too, and I’m considering making one myself some day. I certainly have enough of the seeds here in my yard. So I don’t recommend actually ingesting the seeds unless you’re under the supervision of a trained native shaman (and even then you’d probably do better with peyote or ayahuasca), but the seeds or strings of the seeds made into beads could be useful if you’re doing any sort of divination or trying to receive visions or contact the Otherworld in some other (safer) way. The biggest mountain laurel I have in my yard is right behind the sacred circle. I thought it was an oak tree at first, since it’s as big as a lot of the smaller oaks in my yard. They seldom get that big, but I think it’s a good sign that it’s there. Who knows, maybe that’s why I got such good “vibes” about putting my ritual circle in that spot.